Garnet Sand abrasive is a hard, overwhelming, tough abrasive. It very well may be reused up to multiple times without a misfortune in execution. Garnet can be utilized for cleaning steel in different applications including ship building and fix, tanks, seaward stages, and pipelines. It is likewise used to give surface complete to powder coaters. We are managing in garnet sand that is made by prevalent quality with required fine work estimate. These are as per the customer request. Size for Sand blasting: 20/40, 20/60 and 30/60 are suggested for impact cleaning applications Characteristic hardness results in high peformance amid impacting. Inborn physical and consistency guarantees predominant execution. Garnet Sand is found in numerous hues including red, orange, yellow, green, blue, purple, dark colored, dark, pink and dismal in nature. It is utilized in the fabricate of abrasives, pounding wheels, for cleaning glass, TV tubes, as sand shooting media, in water filtration, in water stream cutting and in antiskid surfaces. Additionally, the Garnet amass is a key mineral in deciphering the beginning of numerous volcanic and transformative rocks by means of geothermobarometry. 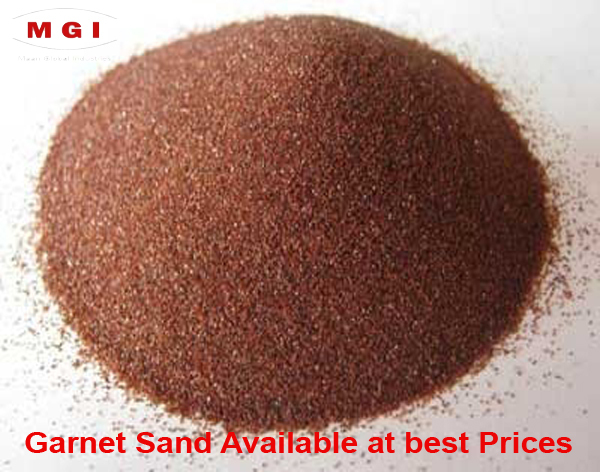 Looking for Garnet Sand in India Call us or email us.